IceCube is a CubeSat mission of NASA’s Goddard Spaceflight Center with the objective to validate a 874 GHz submillimeter wave radiometer for the observation of cloud ice. 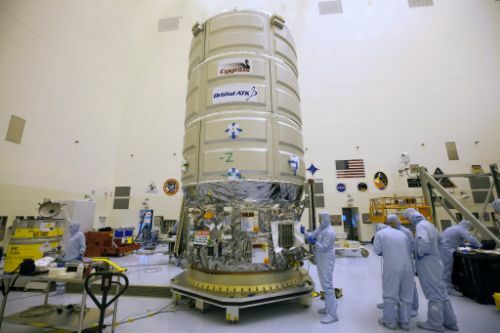 Spaceborne measurements of ice clouds and processes ongoing therein are relevant for climate models, cloud precipitation processes and the regulation of atmospheric radiation. Submillimeter wave remote sensing has been identified as a prime technique for the study of ice clouds due to its great depth of cloud penetrating, excellent volumetric sensitivity to cloud ice mass and feasibility within the scope of currently existing technology. The 874 GHz wavelength has been selected for this and future instruments because ice scattering generates a larger brightness temperature depression in this range than at lower frequencies, allowing a retrieval of vertically-integrated cloud Ice Water Paths and ice particle size. The feasibility of using the 874GHz signal was validated in an airborne measurement campaign that made observations in eleven channels and compared measurements against active radar and lidar measurements, confirming the 874GHz band was ideal for cloud ice assessments. 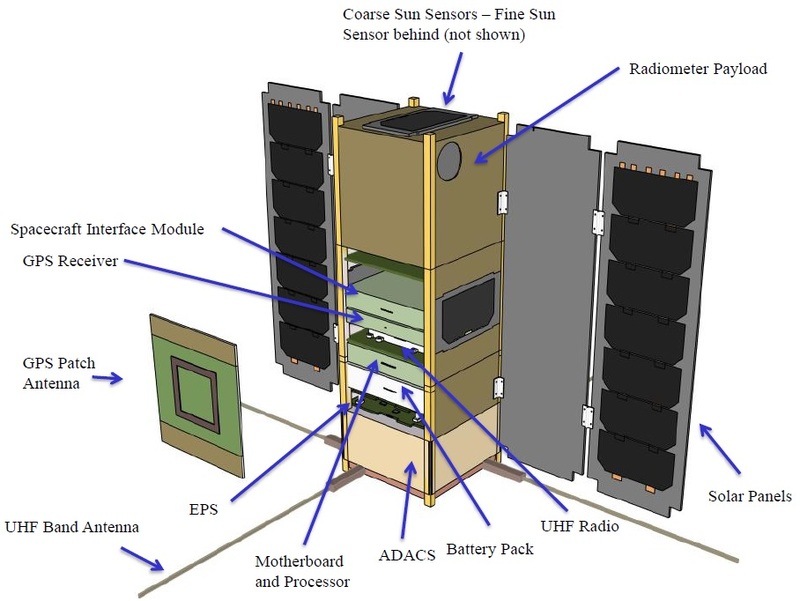 IceCube has the specific objective of testing the 874GHz radiometer technique in a low-cost space-based instrument package to retire risks for future Earth and space remote sensing instruments. The project employs a 3U CubeSat and aims to collect at least four weeks of measurements to validate the technology for future missions that will come with a much higher price tag. IceCube will obtain the first-ever maps of cloud-induced scattering radiance in the 874GHz band and accelerate scientific exploration through efficient and frequent access to space using CubeSats – one of the elements identified when the small satellite form factor was introduced at the turn of the century. 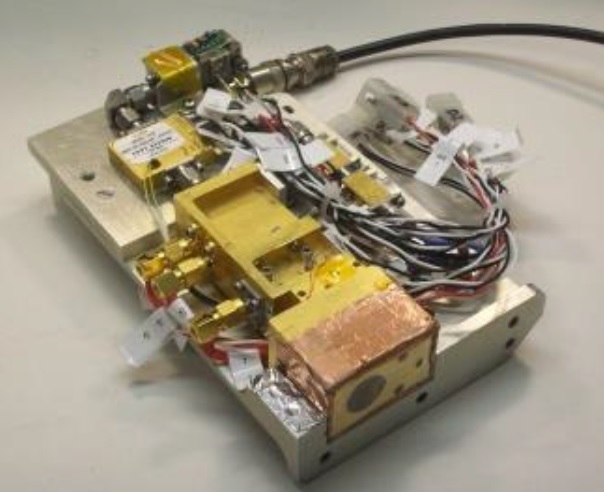 The IceCube satellite complies with the 3U form factor (10 x 10 x 34cm) with 1.7 U dedicated to the satellite platform and 1.3 U occupied by the instrument. 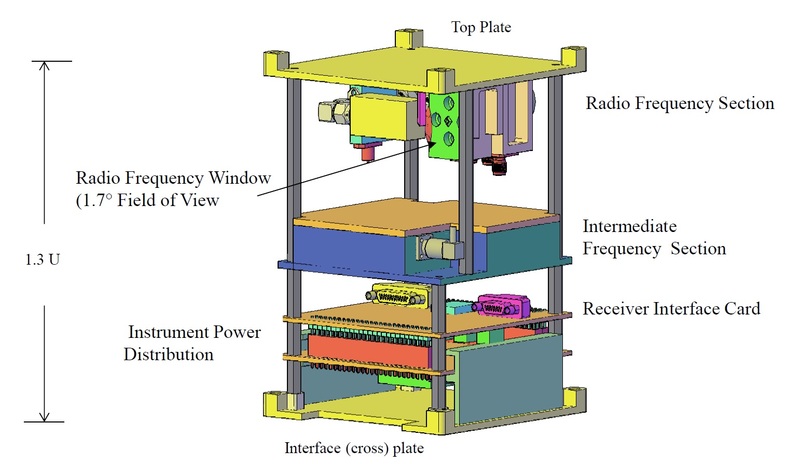 The 4-Kilogram satellite uses a commercially available CubeSat Kit from Pumpkin Inc. with only one custom-made circuit board to build the data and power interface with the instrument payload. The spacecraft hosts two deployable solar panels and body mounted solar cells with a maximum power supply of 38 Watts. 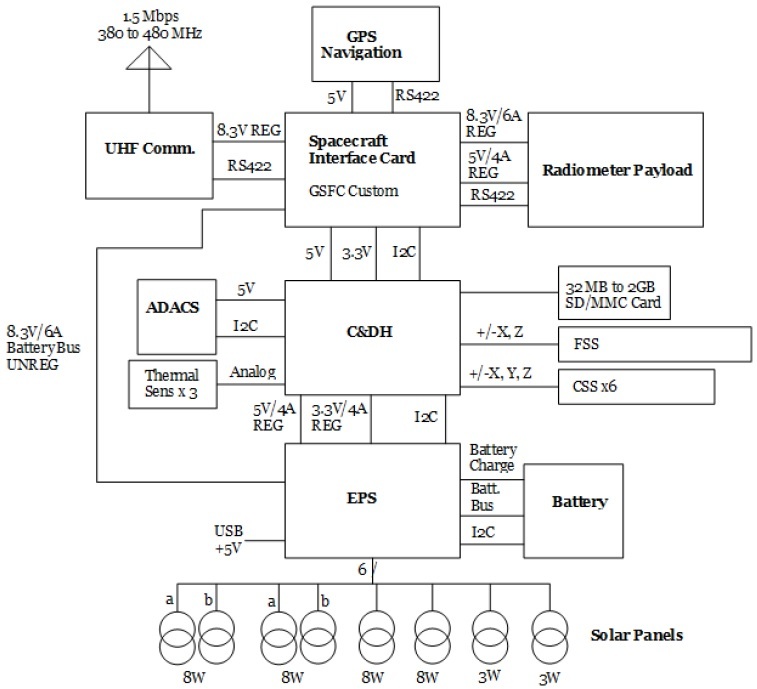 Attitude determination is accomplished with six Coarse Sun Sensors and a Fine Sun Sensor and the satellite’s actuators keep the instrument section in an Earth-pointed orientation. 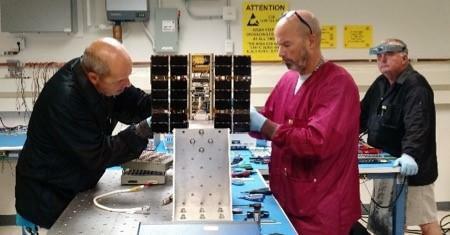 A GPS receiver delivers the satellite’s accurate position for proper geo and time tagging of cloud measurements. 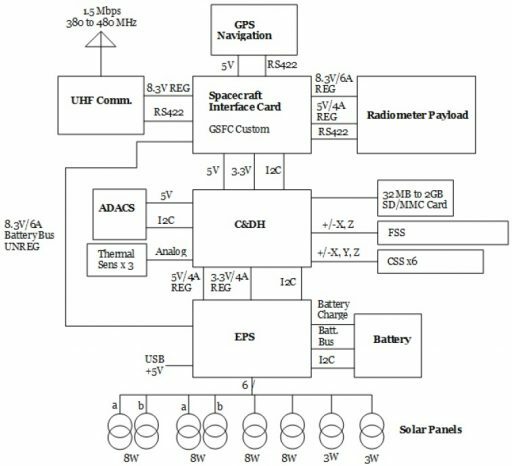 The Radiometer payload connects to the Spacecraft Interface Card which supplies 5V/8.3V power and connects the payload to the data processing system via an RS-422 serial interface. Communications are handled via the 380 – 480 UHF range with a downlink data rate of 1.5Mbps. The radiometer instrument comprises an offset parabola reflector with feedhorn, mixer, ultra-stable oscillator, RF amplification chain, intermediate frequency chain, video amplifier and detector. It is sensitive for vertically polarized signals between 862 and 886 GHz and achieves a noise figure of 15 dB with an NEDT of ~0.15 K.
The radiometer antenna is a straightforward offset-fed paraboloid yielding a 1.7º half-power beam-width. Pointing nadir, the antenna covers a 10 to 20-Kilometer footprint depending on the satellite’s altitude. From the RF mixer, signals are put through an RF multiplier and the RF front end hosts a local oscillator tuned to 874GHz. The instrument captures data over an integration time of one second and employs internal (IF noise generator) and external (deep space views) calibration sources. IceCube will operate in different modes, capturing nadir-pointed, limb and space views to assess the instrument’s performance in different observation geometries. 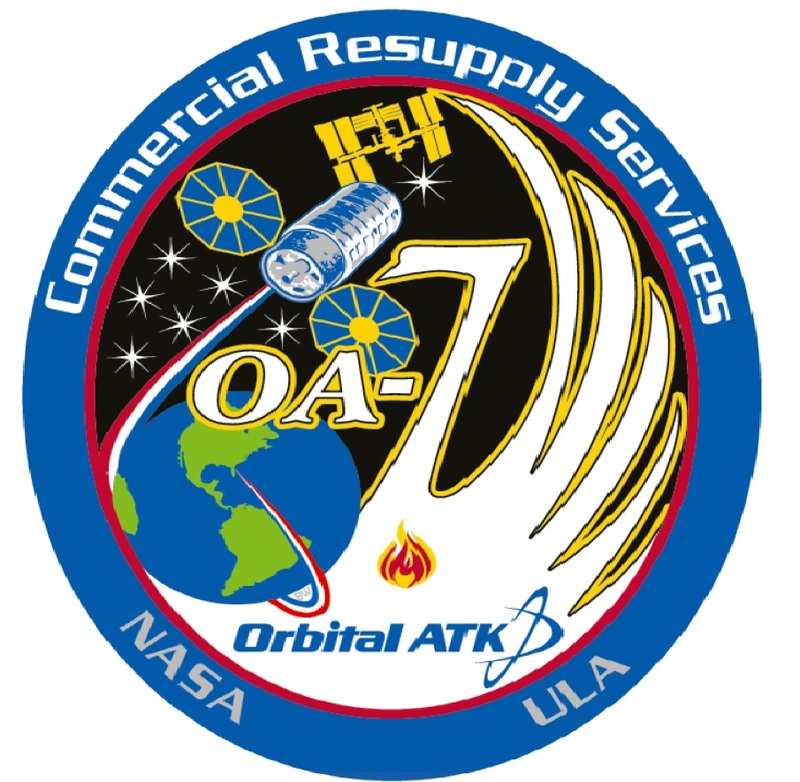 Per the mission objectives, the satellite has to function at least four weeks to capture the required data.